When customers contact us and tell us, “These were the most comfortable work shoes I’ve ever worn!” ...we know they’re talking about Timberland PRO series shoes. For the ultimate comfort in lightweight, flexible shoes with ESD protection for those who need ... (see full details) (see specifications) #TB0A1HR8001. When customers contact us and tell us, “These were the most comfortable work shoes I’ve ever worn!” ...we know they’re talking about Timberland PRO series shoes. For the ultimate comfort in lightweight, flexible shoes with ESD protection for those who need it, these Timberland PRO Powertrain Sport ESD TB0A1HR8 001 Men’s Black Athletic Shoes are your stylish choice. With the cool black and grey webbed design and extra grit built in, you can enjoy a look that lasts with these work shoes. 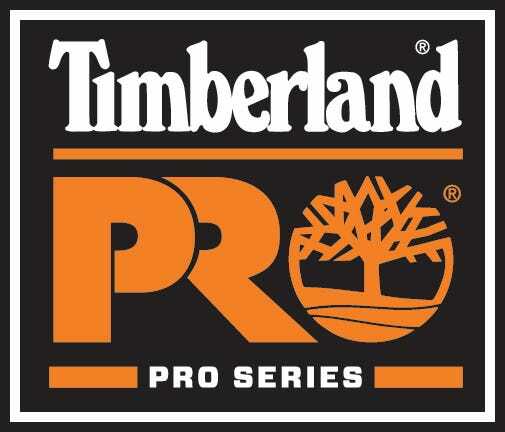 Now, we carry a lot of excellent men's work shoes that provide incredible benefits to our customers as they work hard every day, but when it comes to comfort and safety, Timberland PRO has the perfect formula. Complete with non-marking, dual-density polyurethane outsoles, you have oil-, heat- (up to 248 degrees Fahrenheit), and abrasion-resistant traction for safety in every step. The lightweight alloy toes have asymmetrical shapes for properly fitting toe caps that meet ASTM F2412-11 and ASTM F2413-11 standards. These slip on athletic shoes feature premium nylon uppers with TPU toes and heels overlays. The Ghillie lacing systems provide the best fit for active workers, while the low cut athletic design gives your ankles the room they need to move and bend as you work and also reduces the overall weight of these Timberland PRO shoes. These lightweight safety toe shoes are ideal for those who move a lot by reducing the amount of energy needed to lift and move your feet will leave you with more energy to get through your day. The cement construction is lightweight (even though it doesn’t sound like it!) and flexible, reducing the break-in time to make these Powertrain Sport ESD shoes ready to go right out of the box. Inside these black abrasion-resistant shoes, you can enjoy plenty of Timberland PRO comfort. Starting with the mesh lining, your feet will have fresh air flow all around throughout the day with anti-microbial treatment for odor control and comfort. The single-density open-cell polyurethane footbeds offer constant static-dissipative properties for those who need it on the job. These comfortable footbeds also mold to your feet for a custom fit that will support and cushion exactly where your individual feet need it most. With anti-fatigue technology built in, your feet will feel less shock and stress during your day, extending your stamina and making your feet and ankles very happy. Fiberglass shanks offer light and flexible stability in every step. So bring on some comfort with these slip on Timberland PRO Powertrain Sport ESD TB0A1HR8 001 Men’s Non-Marking Black Athletic from Working Person's Store. My wife has been all over me about exercising, but not because im out of shape, but because SHE is on a health kick all of a sudden. Crazy dieting and all...the whole nine. So of course, I'm now required to go running in the mornings with her, the gym at the crack of dawn on my Sunday morning, and eat god-knows-what for dinner. I was only able to use the excuse "my work-out shoes are too beat up" a few times before she went out and actually bought these for me. They're great shoes, comfortable, no complaints. I'd recommend them more for people who exercise outdoors. I received the bibs the other day, been using them at work and love them! Thank you for assisting me with getting my order over the phone. I'm going to be a repeat customer. Thank you once again for good customer service. Timberland PRO Shoes: Powertrain Sport ESD TB0A1HR8 001 Men's Black Athletic Shoes is being added to your cart.